This past weekend, we celebrated Super Boy's 6th birthday. (He's been 6 since winter, but as his birthday is only two days after Christmas, we always celebrate it in the summer on/near his half-birthday.) As is our habit, after the last guest said "good-bye", he whipped out some stationary supplies to write out a few simple thank you notes. In an effort to cultivate an attitude of gratitude within my Littles, Thank You notes are a non-negotiable around here. My littles have learned/are learning that if someone has shown them kindness in word or in deed, they need to show gratitude in WORD or DEED in return. Often this comes in the form of a simple thank you note. Although teaching this personal discipline is still quite a work in progress, there are a few basic steps that help to make it an effortless process. Make it a house rule that, if at all possible, thank-you notes are to be written immediately...even before the gift gets to be played with or used. My kids rarely have to be prodded to write out thank-you notes when they know that a fun new toy awaits them as soon as they are done. Let the gift become a natural motivator. In addition to reminding your little writers about the parts of a thank-you note (greeting, body, closing, signature), provide a few suggestions of content. As a general rule, I encourage my kids to write one sentence thanking the giver for the gift and at least one sentence detailing why he/she liked the gift, how it will be used, and/or the best part about it. A page that has both a drawing section and a writing section allows even pre-writers to express personal gratitude. Encourage your littlest of littles to draw a picture of themselves using the gift that they received. Ask your pre-writer to verbalize their gratitude as you write down their words. I always like to write out their notes EXACTLY as they are dictated, including any verbal slurs or mis-pronunctiations. (Ex: "Fank you for da twuck. Umm...It's red. I really like it!) Toddler-eze always makes for a humorous and PERSONAL read. Consider creating picture postcards of thankfulness. After the party or event, take a few quick photos of your child holding each gift. Print out these photos, glue them onto pieces of cardstock, jot down your child's dictated message, and mail out as a postcard. Many pre-writers can scribble their own signature. After you have written out all of his/her words, leave space for your Little to sign the note. If your child is able to write but still finds spelling or lengthy writing projects difficult, create a fill-in-the-blank-style note. Write out a basic form letter and allow him/her to fill in essential words or key phrases that would personalize the thank-you for that particular recipient. Help your child make a short list of more difficult words to be included in the note. If my Littles have several notes to write, I usually write a few writing prompts onto a white board so that I can quickly add or subtract the words needed for each individual gift. Encourage sincere gratitude by creating an enjoyable writing experience. Provide special pens, stickers, or card making supplies to make writing thank-you notes an exciting event. My daughter jumps at the chance to write out thank-yous knowing that she can sift through my stash of scrapbook paper and get pens. As the old saying goes, "More is caught than taught." Your kids will be more apt to show gratefulness when they see you leading by example. Make it a habit of writing out thank-yous in front of your children. If a kindness was shown to the entire family, allow each of your kids to include a few words of gratitude into a group-given Thank-You note. Although sincere gratefulness can not be forced, it CAN be nurtured and encouraged by the helpful habit of writing out thank-you notes. How do you cultivate an attitude of gratitude? Love all your ideas! I am terrible about getting my kids (and myself) to write thank you notes right away. I like your idea of waiting to play with the certain gift until you've written the note. It's still a great work in progress for us, too. Oh wow, this is a wonderful list. I wish "thank you" note writing came more naturally to me. 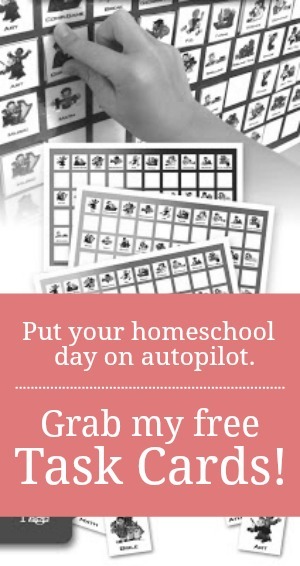 These are great ideas for my kids; I'd also add that since my kids are pre-writers, I lay out alphabet stamps so they can "write" their names at the end of the message I've transcribed for them. Love the stamp idea! My mom was a HUGE thank you note writer...still is. She tried to engrain this helpful habit into my sisters and me. And now, I guess, I am passing the torch to my kids. This is so great! I've been thinking for a while that I need to be better about my children writing thank you notes. This was a great reminder and good info on how to get my two year old involved as well. Great ideas! I think teaching children to show gratitude is so important. I love this post. I grew up with my mom emphasizing the importance of saying thanks and being grateful. My boys are only 1.5 and 3 but we do thanks yous! Sometimes we just colors or paint cards. A fun one to do with younger kids is resist painting using sticker letters. Let them paint away and then peel the stickers and voila! Ooooo...that would be fun. I have tons of letter stickers from my scrapbooking days. Your idea of providing samples is one I hadn't really considered before--what a valuable tool, especially for younger children! Great ideas. Thanks for sharing. I try to get my kids to write Thankyou notes for birthday gifts, but need to be more consistent with it. It's still a work in progress here too. Some days we are more consistent than others but now that my older ones are getting older, they usually initiate the "thank you's" all by themselves.